When I first came aboard the submarine USS CITY OF CORPUS CHRISTI (SSN 705) as a young Ensign there wasn’t room in the officers quarters for me to “get my own rack” right away, so I was temporarily housed in the extra bunk in the XO’s stateroom until a berth opened up. I was a little overwhelmed to be in such close contact with someone of such great authority. The XO position on the submarine is second in command. He is the interface to the captain, and the administrative head of the ship. If we wanted to force the submarine into a Trinitarian context, the XO would be the second person of the submarine Godhead, along with the Captain (the Father figure) and the Engineer (Holy Spirit who keeps everything running). A distorted Trinitarian analogy I know – but aren’t they all? Some of it works: the XO as the Jesus figure is the gateway to the captain – nothing gets to the captain without going through the XO. The XO, captain and Engineer all worked quite seamlessly together, different people but one command. The XO’s role during an emergency is truly Christ like. I remember one mid watch while we were asleep an alarm sounded and the XO prepared himself to go back aft to where the casualty occurred. It was then that I saw so powerfully the amazing role he had. 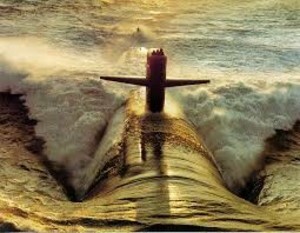 The XO’s job during a casualty on the submarine was to go right to the scene of the problem to be the man in charge. There is a watertight door that separates the forward compartment from the engine-room on a 688 attack sub – and if possible the XO had to open the water tight door, go back into the mess he was supposed to oversee combatting, and close the door behind him. In some scenarios it could mean the man’s death – various films have graphically depicted this risk. The XO was charged with leaving the safety of the forward compartment and going right into the danger, taking charge of the mess with the hope of making it right, even if it meant sacrificing his life. Thankfully everything turned out just fine in this particular case I am remembering. Kind-of a strange analogy to bring up in a post entitled “Why Christmas?” I know. But that is the best way I can describe what Jesus has done. Our world is fallen – melting down if you will – sinking. The alarm has been sounded and God has heard our cry. Through Jesus, God himself chooses to be born right into the very mess – vulnerable, naked, without protection – he ventures beyond the watertight door. The ship of mankind is saved at the expense of our leader himself leaving the safety and blessing of His Fathers' side and coming right into the tragedy to make it right. “Why Christmas?” To save us! To stop the meltdown of society! To heal the brokenness of our world and our relationships. We can be commissioned into and support the recovery effort by listening to His commands, training under His guidance, Following His example. Rest easy my shipmates – Jesus is at the scene and He is the man in charge! We’ll get a chance to follow Him through the rescue effort in the coming months as we try to comprehend the damage and suffering He endures for us on our behalf on Good Friday. But for now, lets be amazed that we have been invited to share his cabin and know him personally. Oh Come Let Us Adore Him, Oh Come let us Adore Him, Oh Come let us adore Him – Christ the Lord!